The Phoenix™ back pack is a uniquely designed frameless pack with a padded back and body. 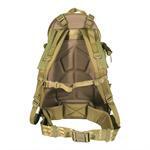 The contoured “S” shoulder straps have a detachable sternum strap and torso lumbar support. The inside back has a pouch to fit an optional 100 oz. 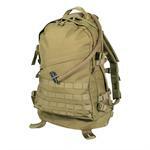 BLACKHAWK!® Hydration System. The pack’s main compartment has two internal securing straps and a pair of utility gear attachment straps.